View of Pluto with colour-coded topography as measured by NASA’s New Horizons spacecraft. Purple and blue are low and yellow and red are high, and the informally named Sputnik Planitia stands out at top as a broad, 1300 km (800 mile) wide, 2.5 km (1.5 mile) deep elliptical basin, most likely the site of an ancient impact on Pluto. 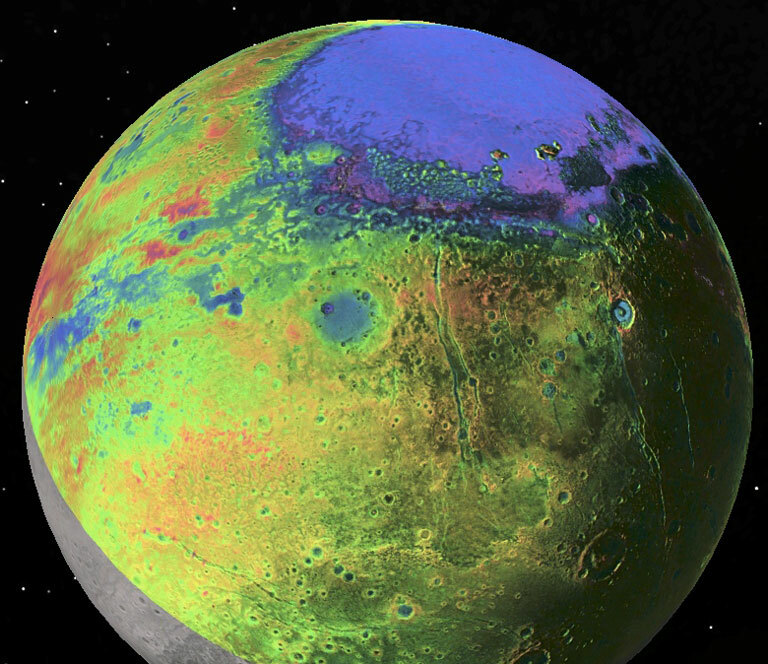 New Horizons data imply that deep beneath this nitrogen-ice filled basin is an ocean of dense, salty, ammonia-rich water. Image: P.M. Schenk LPI/JHUAPL/SwRI/NASA. William McKinnon, professor of earth and planetary sciences in Arts & Sciences at Washington University in St. Louis and a co-author on two of four new Pluto studies published 1 December in Nature, argues that beneath the heart-shaped region on Pluto known as Sputnik Planitia there lies an ocean laden with ammonia. The presence of the pungent, colourless liquid helps to explain not only Pluto’s orientation in space but also the persistence of the massive, ice-capped ocean that other researchers call “slushy” — but McKinnon prefers to depict as syrupy. A new image from NASA’s New Horizons spacecraft is the first look at Pluto’s atmosphere in infrared wavelengths, and the first image of the atmosphere made with data from the probe’s LEISA instrument. 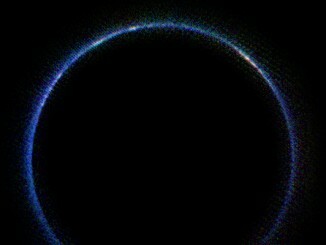 The blue ring around Pluto is caused by sunlight scattered from a haze of hydrocarbon particles in the form of a photochemical smog. 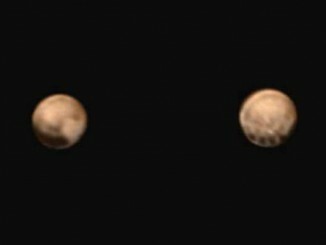 The first well-resolved colour photos of Pluto from NASA’s New Horizons spacecraft, speeding toward a close-up encounter July 14, show a world blotched with dark features spanning two very different sides of the dwarf planet. 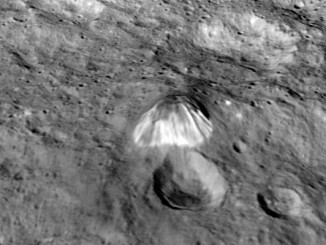 Since its arrival at dwarf planet Ceres on 6 March this year, NASA’s Dawn spacecraft has been slowly spiralling closer to this enigmatic little world. Mission scientist are nearer finding explanations for the intriguing bright spots in a crater named Occator and why an isolated mountain — as high as any in North America — is sitting in the middle of nowhere.